I gave 8bitapp a try, to blurry but decent results. I go Metro! Alex Smith is just a regular guy who happens to spend his days in a top-secret mountain laboratory (okay, it’s NASA’s Jet Propulsion Laboratory in Pasadena), proclaims himself a “supergeek” and spends his nights feeding his inner nerd. He’s also a regular Metro rider who fills his commute – a trip from Downtown L.A. on the Gold Line with a transfer to the Metro 177 bus to JPL – with more geekery. Specifically, he’s programmed an iPhone/iPad/Android application that creates “3D holographs” from still pictures. The app is called 8bitapp – named after the old school Nintendo style imagery it creates – and it’s available for 99 cents from the Apple App Store and the Android Market. 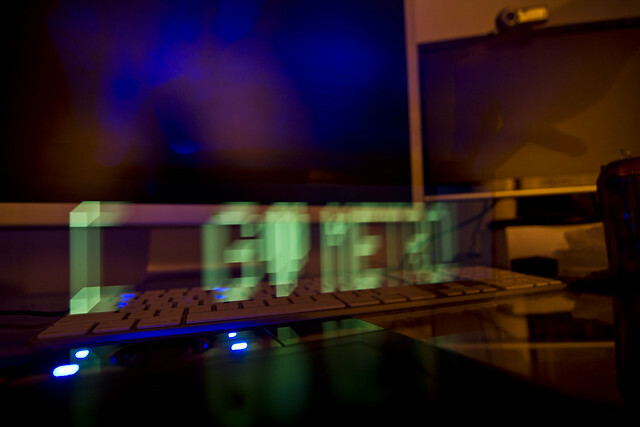 In essence the app lets you use your smartphone to create light graffiti in conjunction with a web cam or DSLR camera. To better understand how it works, check out this video Alex made and look at example pictures posted to his Flickr group. As a part-time geek myself, I had to learn more. Fred: How long did it take you program this puppy? Alex: About two weeks for development and another two weeks to test its brains/guts. F: You ever thought of making a transit app with Metro’s developer data? A: Oh boy, I did not know this existed, there are some cool things to mash up this data with. I’d like to mash up Yelp data with Metro developer data so one could quickly see what cool places are nearby to a train stop and explore the city a little more. Maybe even get a list of places at the time I’m planning my trip. Alex shares more, including why he rides, after the jump. F: You’re a self proclaimed supergreek, what geeky technology would you love to see become part of your transit commute (it can be realistic or completely fantastic)? A: This is doable. A social app that lets me listen to others’ music on the train, and I can share my music library back to the community. Not to download though, just listen. People can then make their own little communities/groups by music types and tastes. From there they can make their own radio stations which people can listen to on the train. Metro could even cover network upkeep and maintenance costs by offering advertising on the radio stations to businesses that are near the stops. I’d get off the train every day in Chinatown and get noodles if I knew which place had specials within walking distance from my stop. Word. F: Gotta ask, why do you ride? A: I can normally drive in 20 minutes but I like that I can learn something new while riding. A lot of JPL’ers who ride that I have spoken to will work on thoughts/ideas while commuting and come up with some really good stuff that would otherwise go unnoticed. F: Anything else you’d like to share? A: I gave you guys a big thanks in the app info so that hopefully people can realize the potential fun, money and productivity increases they can gain by using public transportation. Thank you for encouraging my brains. Thank you Alex for inspiring our brains! Learn more about 8bitapp at 8bitapp.com. Readers: if you do something amazing to maximize your time during your Metro commute, do share! You can leave a comment, or email us your story at sourcemetro@gmail.com.